FR. De marché en marché, de coin de pêche en partie de monopoly, Martha, Reymond et leur fille Lise vivent et s'aiment à contre-courant. Le bonheur semble à portée de main. Mais les fantômes de l'enfance guettent, et Martha, traquée, entraîne son petit monde au fil d'une dérive sans fin. EN. Martha is a woman with problems. She is not the ideal mother for her daughter Lise, or the ideal wife for her husband Reymond : she taunts Lise with lines like "you spoil everything", and stays out at bars while Rey takes care of everything. Her childhood is never really disclosed, but she is shunned from her family, who regard her as some kind of an embarrassment. 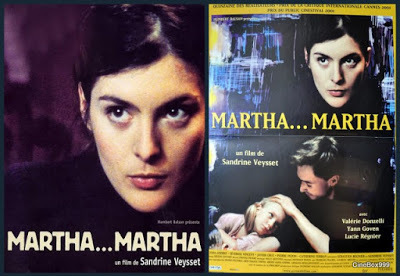 The characters in this film are wonderfully fleshed out : Martha, who knows she is acting stupidly but can't stop herself; Lise, their intelligent daughter; and Reymond, the loving father who manages to keep it all together during the films intense third quarter. A gritty contemporary neo-realist piece, this amazing film is about never giving up on people, no matter how dire the situation (indeed it is even dedicated to "the need for consolation"). Cast: Valérie Donzelli, Yann Goven, Lucie Régnier, Lydia Andrei, Séverine Vincent, Javier Cruz, Pierre Pezon, Catherine Ferran, Robert Beal.